Disclosure: Links to products for sale may be affiliate links. Coconut oil is good for your skin, and feels much better when it’s whipped, especially during winter when your coconut oil is probably hard and difficult to get out of the jar. Fortunately, it’s really easy to whip, and then you have this wonderful lotion that feels even better to use. Put the coconut oil into a mixing bowl. Use your mixer to beat it on slow to break up the coconut oil. As the chunks disappear, increase speed to high to really whip it. It should become light and fluffy, and look like about twice as much as it was. Add essential oils, just a few drops, if desired as you whip the coconut oil. Spoon into a container that you can close up. I prefer glass jars. Keep in your bathroom when the room is cool enough, but know that this can still melt as the weather warms up. You can keep it in the fridge too, and it will not get as hard as unwhipped coconut oil would, but will be firmer than if you keep it out. Don’t try a blender to whip this recipe up – you’re more likely to simply melt the coconut oil. You can also combine with other natural skin care ingredients such as shea butter , cocoa butter or vitamin E .
If the weather is warm enough that to coconut oil is melting, this probably won’t work without a little help. Cool the coconut oil in your refrigerator first, then try to whip it. You could also try freezing the bowl first. The type of coconut oil doesn’t matter too much, beyond personal preference. If you like the coconut smell, virgin coconut oil is fine. If you can’t stand the smell, make sure to use a refined version. Use this just as you would other moisturizers, but be prepared for it to take a little more time to soak in. 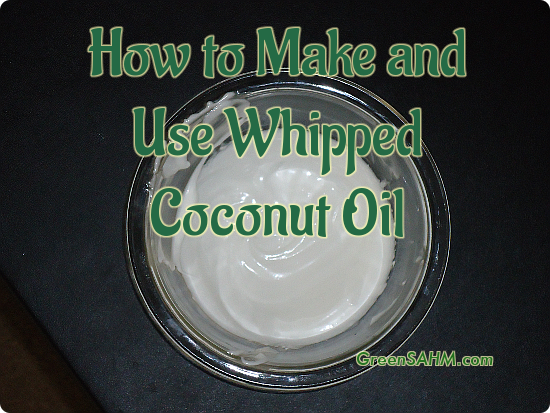 Some people find coconut oil too greasy, but the whipped version is easier to put on more lightly. Many people get the best results putting this on damp skin. If you have cracked feet, this can work as a pleasant overnight treatment. Rub it into your feet, then put socks on and go to bed. The socks are important for best results. Whipped coconut oil also makes a good hair treatment. Rub some into your hair, especially the ends, which tend to be the driest. Wrap your hair in a towel so that you don’t get oil everywhere and let it sit for an hour or overnight. Wash your hair thoroughly in the morning. If your hair is still oily, wash again or try conditioner – some people find that conditioner gets the oily feeling out better than shampoo. This works as a lip balm too. Apply a small amount to your lips with your fingertips. Don’t try to carry it around in this form, however, as it will melt in whatever container and could leak out. You can melt coconut oil with beeswax if you want something more stable to carry around. As this recipe doesn’t include any stabilizers, the coconut oil will still melt easily in warmer temperatures, and may lose the air bubbles that make it so light over time even in cooler weather. Don’t make a large batch and think that it will stay that way forever. Make a reasonable amount for your needs, and rewhip as necessary. Published by Stephanie, in Eco Friendly Beauty Tips. Tagged with coconut oil, homemade beauty products, natural beauty.